ScriptedTextures have been implemented in all generations of the Unreal Engine, but their usage differs between the various generations. This is a page about a basic procedure related to the Unreal Editor. You are encouraged to link this page from other pages instead of explaining the procedure there. 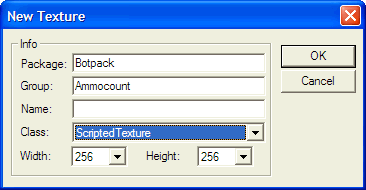 A ScriptedTexture(RTNP, U1, UT) can only be created statically via UnrealEd's Texture Browser. Select File -> New... from the browser's menu. Specify a target package and texture name, optionally also a group name. Set the texture class to ScriptedTexture. Pick texture dimensions that fit your needs. As always, you need to save the package, unless you put the texture in the myLevel pseudo-package. Switch to the Texture Browser. Click New at the bottom of the browser panel. Pick the desired texture dimensions. Again, you need to save the package if you don't use myLevel. You can create the ScriptedTexture(U2, U2XMP, UE2Runtime, UT2003, UT2004) either statically with UnrealEd 3 or dynamically in UnrealScript. Use this method if you need a texture e.g. for a CameraTextureClient(U2, UE2Runtime, UT2003, UT2004). Use the factory class "Raw Material". 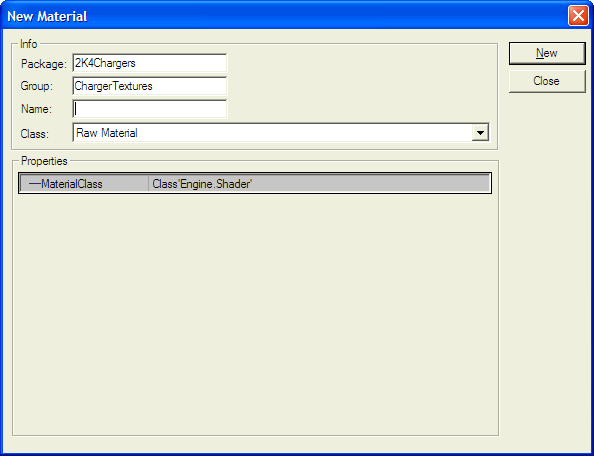 Set the MaterialClass in the factory properties to ScriptedTexture (class'Engine.ScriptedTexture'). The ScriptedTexture properties window should open automatically. Set the desired dimensions via UClamp and VClamp there. As usual, unless you put it in myLevel, you need to save the package. This is a page about a basic procedure related to UnrealScript. This creates a new ScriptedTexture that is SizeX pixels wide and SizeY high that is rendered through the RenderTexture() event of someActor. Note that this example may waste resources if the ScriptedTexture will only be used for a limited duration. The UT2004 Hellbender (Onslaught.ONSPRV) provides a more efficient example for this case, using the global ObjectPool(U2, U2XMP, UE2Runtime, UT2003, UT2004) to allocate and release the ScriptedTexture used for the license plate. This creates a new ScriptedTexture that is SizeX pixels wide and SizeY high that is cleared to ClearColor before redrawing. RenderFunction must be a function without return value that has only one parameter of type Canvas(UDK, UT3). 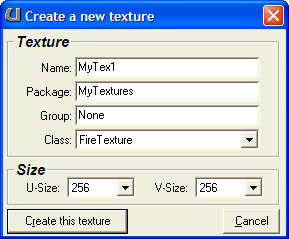 Usually you will want the ScriptedTexture to be specified as Material parameter. Last modified at 09:36, 20 March 2010.